The smell of sweet cooked dough fills the air. 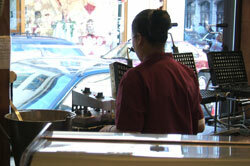 A woman sits at a stand with the tools of her trade: a bowl of batter and a hot waffle iron. She scoops up a ladle of batter and pours it onto the grid of the open iron, where it starts to toast immediately. The waffle iron’s lid is snapped shut, and the woman deftly flips the entire contraption upside-down, letting gravity ensure that the waffle is evenly browned on both sides. She runs a knife around the edges of the waffle iron to scrape away any excess batter. And just a few moments later, she opens the iron, plucks out the steaming waffle, and hands it to an eager customer. Then the procedure starts all over again. The enticing scent of the waffles is all the advertising she needs to ensure a steady stream of buyers. On the perimeters of the cobbled square, people sit with dark, malty beers, laughing and watching the activity around them. Some are travelers passing through the city, others are businessmen on their lunch break, escaping the confines of their workplaces to share a space on a wooden bench in the open air. A musician plays nearby - a bit too loudly, perhaps - and children run around chasing the birds that have landed on the square, while their harried mothers look on. It’s a crisp, bright day in Brussels circa 1565. 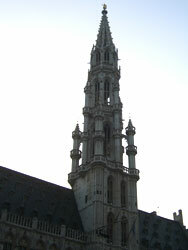 Four hundred and forty years later, the same scenes are played out on the Grand Place in the heart of Brussels. What astonishes me about the city is how many things haven’t changed in the four centuries since Pieter Bruegel painted his images of Flemish life here. I wasn’t expecting so many threads of history and tradition to remain unbroken from his day to mine. I certainly wasn’t expecting to find such a beautiful, walkable city, one that takes Gallic culture and Germanic culture and combines them in a way that is comfortingly familiar yet intriguingly unique. My image of Brussels has been shaped by what I see on TV: suits hurrying through the EU quarter, glass and steel, a soulless landscape of lobby groups, PR firms and diplomats. It’s my own fault for never looking beyond that image to find the roots of the city. The impetus to do this finally came a few weeks ago, when Jeremy suggested a weekend in a Brussels - ostensibly to attend a conference on information architecture, but really to explore a European capital that was completely unknown to us. A little advance reading before we went revealed that Brussels has one of the best-preserved (late) medieval squares in Europe. Not only that, the city was also the final home and eventual resting place of none other than Pieter Bruegel the Elder himself, several of whose works now hang in a gallery there. What’s more, the Belgians are very, very into food, and Brussels is awash with cafes, pubs, and restaurants. The Bruxellois will eagerly consume everything from waffles on the street, to moules et frites at a brasserie, to 6-course French haute cuisine in sumptuous 19th-century surroundings - and Jeremy and I intended to do the same. And so it was that we hopped on the Eurostar one fine Friday afternoon and were whisked off under the English Channel and into the heart of Europe. The Eurostar alone feels like a great adventure. Even though trains are an old-fashioned way to travel, it feels very futuristic to be able to board one in London and be deposited in the center of Paris or Brussels just a few short, comfortable hours later. Only 20 minutes are spent in the Chunnel itself. The rest of the time, the train chugs at a faster (on the Continent) or slower (in England) rate through rolling countryside. On the English side, after you get out of the London suburbs, terraced houses line the streets of towns along the way. On the French side, farmland surrounds the little villages, and church steeples and medieval ruins peek from the tops of the hills. The hierarchy of languages used to make announcements over the intercom also shifts as the train moves through each country: English, then French, then Dutch while you’re still in England; French, then English, then Dutch when you emerge in France; Dutch, then French, then English as you pull into Brussels (a city which, though 80% Francophone, is actually located in Dutch-speaking Flanders). Jeremy and I were lucky enough to get a great deal with the Eurostar and the Metropole, a fabulous Art Nouveau hotel within easy walking distance of the great sites of Brussels. After we arrived in the late afternoon, we dropped off our bags and took a quick walking tour of the area. One of the first things I saw when we stepped outside was a bit of Belgian waffle on the ground, which amused me no end (Brussels is very clean, by the way - bits of waffle are probably the worst litter you’ll come across). Before we knew it, we found ourselves in the Grand Place, which was teeming with people eating, drinking, relaxing, taking photographs, and enjoying how the setting sun lit up the Hôtel de Ville and the ornate 16th-century guild houses which surround the square. We had no time to linger, however, for we had reserved a table for a six-course tasting menu in L’Alban Chambon, the French "gastronomical restaurant" located in the Metropole. Dinner was magnificent, with impeccable (yet friendly!) French waiters and a different wine to go with each course. I surreptitiously took notes on everything we ate and drank (which will be written up in detail at a later date). By the end of it all - almost four and a half hours later - I was tipsy, stuffed, and completely satisfied. After so much rich food and a super-strength espresso, I didn’t sleep a wink that night. But it was worth it. The next day was beautiful, sunny and warm, and we spent the entirety of it in a hotel conference room. A dreadful mistake. When we were finally set free after 6, we stumbled outside into the gorgeous evening and vowed to play hooky the next day so we could give ourselves over to Brussels entirely. But first, we made the most of a balmy Saturday night by finding a table in a charming restaurant (Bleu de Toi) with lovely food and a fantastically good-natured waitress who was consistently funny and cheerful despite the fact that we hadn’t made a reservation on a busy Saturday night, we couldn’t read the handwritten menu, and our French was abominable. I believe her name was Coco, and though it’s unlikely she will ever read this, I just have to say merci beaucoup, Coco. You made our evening a real pleasure. The pleasures continued as we bar-hopped our way back to the hotel, admiring (if that’s the right word) the scaffolding-covered Manneken Pis along the way. We stopped on the illuminated Grand Place for a beer, and a short time later found ourselves traipsing down a medieval alleyway and into the quiet, super-atmospheric Au Bon Vieux Temps. Belgian beers are delicious but strong, so after just one drink each we decided to call it a night, and we headed back to the Metropole - somehow without giving in to the temptation of a Belgian waffle along the way. I declared the following day to be museum day. Before leaving on this trip, the one thing I said I absolutely had to do in Brussels was see the Bruegel paintings hanging in the Musée d’Art Ancien. The day kicked off right with a hot, sugary waffle on the Grand Place, and afterwards we tootled around the museum of modern art, where we saw many Magrittes and a wacky exhibition of the whimsical Panamarenko. When gallery fatigue began to set in, we wandered to the chic Sablon area of the city for lunch. Our attempt to first find a working ATM turned into a veritable odyssey which, conveniently, led us right past Bruegel’s house (a simple building on a busy street - just as I’m sure it was in the 16th century). Lunch was eventually enjoyed al fresco at La Tortue de Zoute, where we went traditional: moules et frites for me and an americaine for Jeremy (an americaine is essentially steak tartare - why they call it "American" I have no idea). Time was pressing on at that point, so we legged it back to the museum and I finally got to indulge my passion for all things old, Flemish and painterly. The Bruegels are tucked away at the end of the Flemish painting circuit, and though I was desperate to see them, I couldn’t help but spend time gaping at the fantastic, terrifying Temptation of Saint Anthony by Bosch and countless other works on show. I have a real weakness for the richly colored, wonderfully earthy and alternatively dour and hallucinatory paintings of the Flemish masters. But Bruegel - ah, Bruegel is in a different class again. 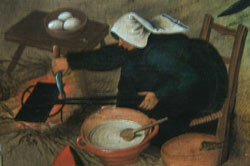 I recently came to the conclusion that if Bruegel were alive today, he would definitely have a Flickr account. His paintings are certainly the closest thing to a photograph of 16th-century life that I’ve ever seen - and as such, they simply captivate me. Bruegel is so adept at capturing the beauty of everyday activities. And he’s funny - his ice skaters are falling all over the place, his children run around flailing their arms in joy, his peasants are hard-working and equally hard-playing, and his paintings are filled with food, drink and music. They’re filled with drama and tragedy as well. Three of the key paintings in the museum in Brussels are The Census of Bethlehem, Landscape with the Fall of Icarus and The Fall of the Rebel Angels - stunning works and unquestionably masterpieces. But the painting that kept drawing me back to it in Brussels was the simple Winter Landscape with Skaters and a Bird Trap, a rather small image of skaters cavorting on a frozen river under a white winter sky. I love it partially because I like all winter landscapes and partially for its similarity to Hunters in the Snow, but mostly because Bruegel’s rotund little peasants are so lively and expressive that you think if you stare at them long enough, they’ll start to move. Anyway, I’ve gone on about Bruegel at length elsewhere. It was hard to drag myself away from the paintings, but the museum was closing and we had a date to keep with two lovely Belgian acquaintances of ours, whom we met for dinner and drinks. They weren’t familiar with Brussels themselves (one had never been there before), so ironically, Jeremy and I became somewhat like tour guides, taking them to a restaurant we had heard was good (Aux Armes de Bruxelles - and it was good, if slightly touristy), and then going back to Au Bon Vieux Temps before seeing them off again. Jeremy and I were tired by that point, so we meandered back to the hotel. Seeing as it was our last night in Brussels, however, we nipped into the wonderfully ornate Café Metropole for one last drink. The Café Metropole is a real Belle Époque sort of confection - all giant chandeliers and gilt decorations - and our waiter, with his handlebar mustache and long apron, looked like he stepped right out of the year 1895. 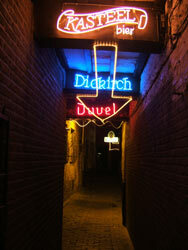 We lingered over our late-night beers, soaking up the atmosphere and commenting that life in Brussels was fine indeed. 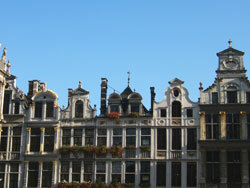 For more pictures of Brussels, check out my Flickr account.